What is the absolute best way to display your images? Importantly, they must be placed in context and should be processed to complement each other. I do this for you with my signature wedding album. 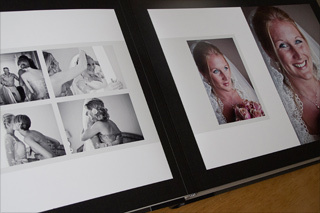 I would like you to have an album of your wedding images whose design is modern but timeless. An album that presents the story of your day perfectly. An album that you will want to show your friends & families. It must also be of exceptional build-quality to stand the test of time as it is passed down through generations. “Can I just say a MASSIVE thank you. Got the album yesterday and IT WAS AMAZING!!!! Never seen anything like it. My clients are often busy professionals or celebrities. They tell me that they rarely have time to sit down for hours and deliberate over what to include or not in their wedding album. For this reason, I have made the entire proofing, design and delivery process as streamlined as possible. You will want to see your images not as roughly-processed proofs, but as fully-finished photographs. I begin designing the album before I process the images. This is critical. Processing images randomly, before designing, produces disjointed, confused albums. You will proof your images online. I use every photograph possible in my designs but leave you to make the crucial final decision: let me know if there are any images that you don’t want included. 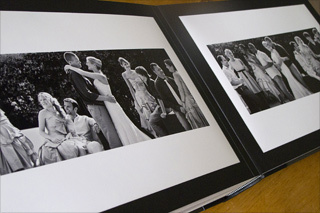 Few photographers actually ‘design’ wedding albums. 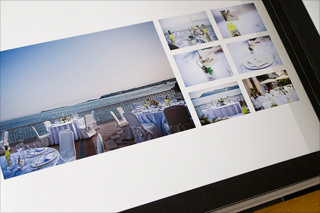 Many prefer to create layouts - dropping the clients' chosen images into pre-purchased templates. These are two very different approaches. I design. Genuine designing is a time-consuming process but one which I truly enjoy and value the importance of. It's also important not to be restricted by a number of images included. I don't have a general rule about which images convert to black & white. If I find the colours distracting from the content, that's a good starting point. I design your album as if it was my own. Every page is designed by hand and I ensure that they combine to tell the story of your day logically. Images will be sensibly grouped where necessary and impact images are given more priority and space. 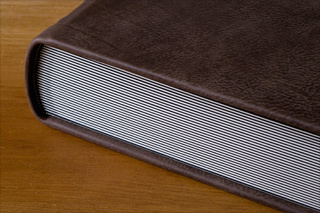 Your wedding album has a graphite-coloured metal front cover. (It's heavy!) 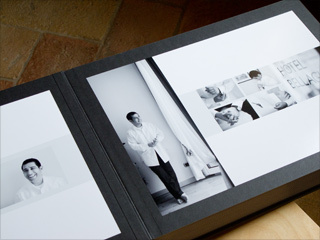 Inside are 14” x 10” composite-prints* - displayed in, and protected by, black linen mats. A beautiful Italian ‘mocha’ leather cover (pictured right) is also available as an upgrade for those who prefer something a little different or for those that are thinking of a more 'vintage' wedding theme. All are hand-constructed in Australia. 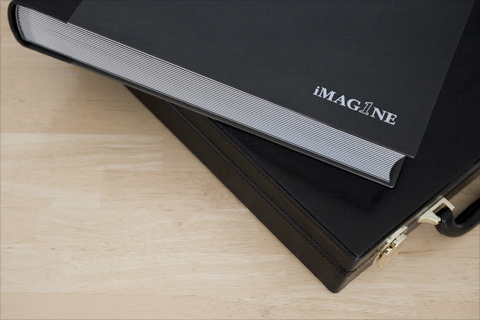 The album is delivered inside its own briefcase to keep it safe & sound in transit. You can be certain that it's well protected when you take it out with you to show your friends & families. * The images are arranged graphically and printed on a single photograph. << Important or impact images sometimes occupy a page on their own. Otherwise, I complement them with smaller supporting/detail images.